My Kingdom For A Horse are delighted to have won 'Best Cafe Dining - Adelaide City' at the 2018 Restaurant and Catering Awards. Thank you to our wonderful team and customers! On Wednesday 13th November My Kingdom for a Horse was invited to attend The Advertiser 2017 Food Awards and we were awarded 'Best Cafe’. We’d like to thank our incredible team and all of our amazing customers. 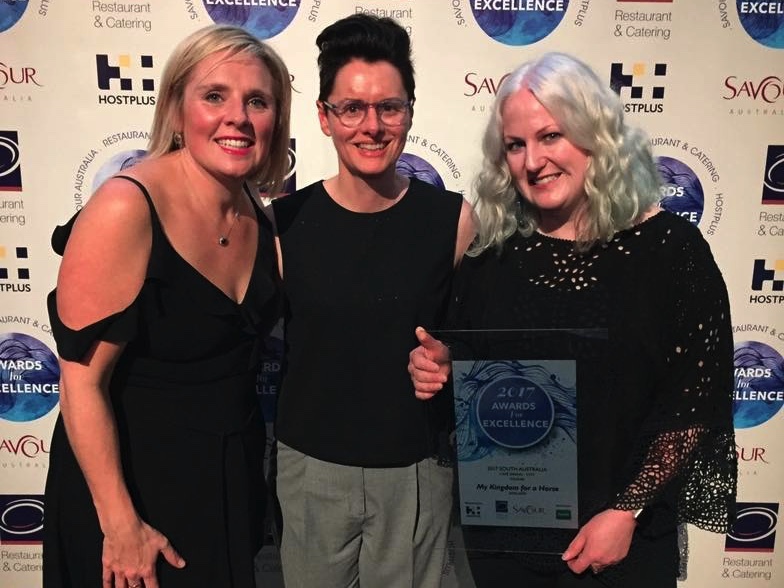 On 31st July 2017, My Kingdom for a horse attended the 2017 Awards for Excellence and was awarded 'Best Cafe Dining ’ in Adelaide city by Restaurant and Catering SA. We’d like to thank all of our fabulous customers and team. Le Cordon Bleu alumna and entrepreneur Emily Raven is passionate about coffee. She is Australia’s premier female specialty coffee roaster, and takes pride in training her staff to follow her footsteps.